Not having the CD4060B chip I substituted a 74HC4060 (U1). This necessitated a 5 V regulator (LM78L05, U0) to supply power within the limits for this chip. 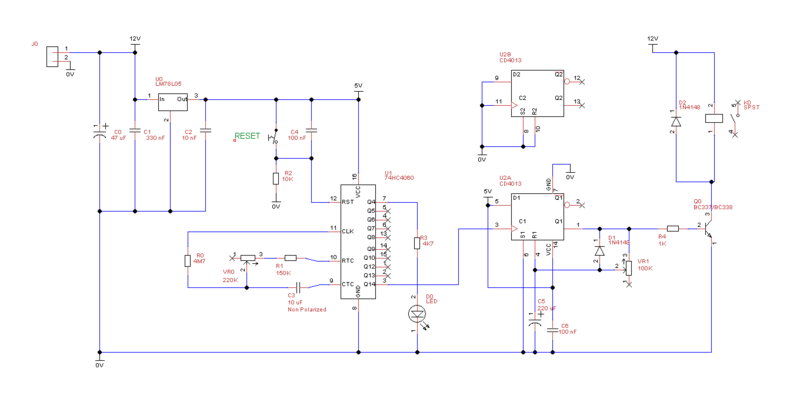 I used a CD4013 dual flip flop for the monostable output stage, as described in this article (Fig. 9), instead of a CD4001 quad NOR. If I built this again, I might use a 7555 timer (as in Fig. 14 or like this). I used a mains relay on the circuit board itself, rather than mounted separately, because I happened to have one with a 12 V coil that was suitable for this purpose (taken out of a different microwave oven). One final adjustment: to shorten the interval between turns I removed the link from strip 5 to pin 3 of U1 and reconnected it between strip 5 and terminal 15 of Q1. I adjusted the potentiometers VR0 and VR1 so that LED D0 flashed every minute or so and the relay turned on for a 10 second burst every hour. Here is the completed timer circuit in situ. There is a slip of yellow plastic behind the board to insulate the solder connections on the back. The brown wires connect the live terminals on the noise filter PCB (on top of the fan assembly) and the fan, via the relay. 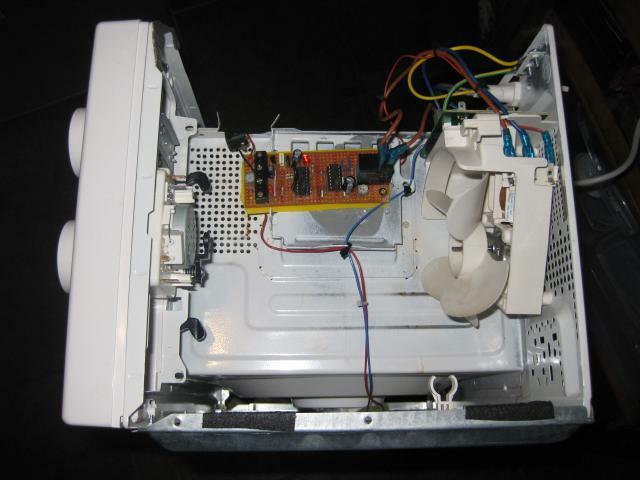 The blue return wire from the fan is plugged directly onto the neutral terminal on the PCB. When the timer triggers the monostable, the relay will turn on both the fan and the turntable. The fan turning on is just a side effect of wanting to turn on the turntable so I could have removed the blades. On the left hand side of the timer board, a barrel adapter for the 12 V supply is connected to the terminal block. Here is a simplified schematic showing how the timer, fan, and turntable motor are connected up. The fuse and ground connection (to the microwave casing) are essential features of the mains supply which is 240 VAC in the UK. I put a switch on the 12 V supply to the timer circuit so that the turner can be switched off during lockdown. (The same thing could be achieved by unplugging the mains.) The switch doubles as a timer reset because turning the timer off and on again resets the timer. So I ended up not using the terminal connections on the timer board that allow for a reset switch.